DART I'm Connected® videos feature some of the behind-the-scene staff from community relations, creative services, maintenance, operations and construction, as well as members of the local community. The series name plays off the marketing theme line currently in use by the multi-modal transit agency, "It's All Connected." New videos are added weekly. Take a ride on a DART Rail test train as it makes a complete run between Buckner Station and North Carrollton/Frankford Station. Fifteen new Green Line stations will open on December 6, 2010, completing the 20 station, 28 mile project. Whether you're headed to work, to the hospital, to dinner or to the game - everything changes with Phase II of DART Rail's Green Line. The second phase adds 24 miles and 15 spectacular stations, bringing the Green Line to a whopping 28 miles and expanding the DART Rail System to a new total of 72 miles. From far southeast Dallas to north Carrollton, communities, businesses and companies are gearing up for the December 6 launch of DART's most promising rail extension yet - the Green Line Phase II. The remaining 25 miles of the 28-mile Green Line open in December 2010, including service to Pleasant Grove in far southeast Dallas County, the Stemmons Corridor, and the cities of Carrollton and Farmers Branch to the northwest. Beginning Monday, Sept. 14, the first 3 miles of the 28-mile, $1.8-billion Green Line opens service to the new Deep Ellum, Baylor University Medical Center, Fair Park, and MLK, Jr. stations. And the same day, regular full-time service extends to Victory Station at American Airlines Center, where DART Rail service has been limited to sporting and entertainment events since November 2004. Read more from Green Means Go! Excitement is building throughout Deep Ellum, Fair Park and South Dallas as work crews race toward the September 14 grand opening of the Green Line - the next phase of DART Rail and the great yellow and white hope for much of the historic area. DART's $3.4 billion rail expansion is creating new connections, reducing traffic and pollution, and stimulating the economy. 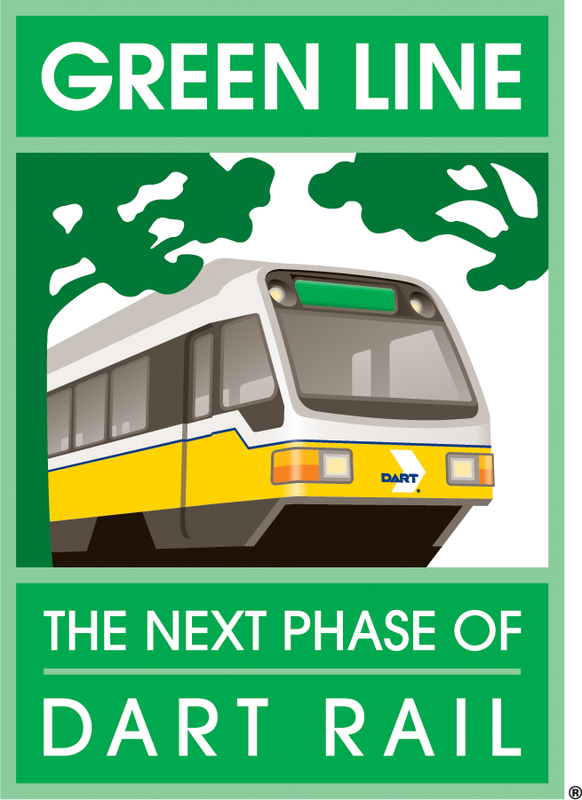 The Green Line is in "countdown" mode for a September 2009 opening with initial service to Deep Ellum, Baylor Medical Center and Fair Park. Currently, nearly 2,500 people a day are working feverishly to keep our new Green Line trending ahead of schedule and within budget. Read more from Laying tracks - fast! As DART's Green Line expansion races ahead, a big part of the project is keeping neighborhoods and businesses up to speed on construction activities. DART Rail has become a fixture in the local culture. Don't look now, but it's about to double in size and community input is the cornerstone. In a historic year when North Texans celebrated the 10th anniversary of one of the nation's youngest and most successful light rail systems, DART and its constituents looked forward more than backward. The seeds of change have been sown. Now comes the real work of growing the 45-mile DART Rail System to more than twice its size, starting with the construction of the $1.67 billion Green Line spanning the northwest and southeast corridors of the service area. The only thing more exciting than looking back at the 10-year history of DART Rail is looking 10 years ahead, when the light rail system will double to more than 90 miles and 62 stations. With its 9-year-old light rail system positioned at the forefront of the American "rail-volution," management, staff and frontline workers spent FY05 gearing up for a $2.4 billion expansion that will double DART Rail to 90 miles through 2013. On a bright day this spring, construction crews will begin breaking up pavement on the eastern edge of downtown Dallas - the first step in straightening the curve of the DART Rail line as it comes up out of the tunnel from Cityplace and meanders to Pearl Station. More important, it signals the official start of construction on DART's long-awaited light rail expansion. Read more from On our way! © 2010 DART. All rights reserved.